Were the Spartans truly the greatest warriors of all time? It will surprise precisely nobody that the 300 movies are not historically accurate portrayals of the Spartans, but the movies do lean on an existing myth. We all grew up thinking of the Spartans as the ultimate military badasses. Was this true? No one could deny that Spartans were one of the most impressively organized militaristic cultures in history. Their style of warfare, an eight-person-deep unwavering wall of shields and spears, broke nearly anyone who went up against them. Their intense training, starting at eight and officially lasting ten years – and unofficially never stopping – made for an absolute discipline. Their part in the Battle of Thermopylae in 480 BC is rightly acknowledged as one of the turning points of history. In some ways, they are given too little credit. They weren't the guileless, undifferentiated blunt instrument they are so often made out to be. They had different fighting forces – armies, navies, and elite forces. Like all successful militaries, they employed and promoted crafty tacticians. Spartans were among the first fighting forces to recognize the importance of spycraft and infiltration. The kryptea, a specially-trained unit, functioned as something between a spy agency and a secret police, keeping an eye on the conquered territories and on the troops at home. The Spartan empire, though small compared to world empires, was large compared to those of their neighbors. They held it for hundreds of years. This was not an accident. It's now common knowledge that the Spartans were a slave-owning society. While a loss to the Persians would have meant enslavement for the Spartans, it might have meant freedom for the conquered territories around Sparta. What's not often discussed is the way being a slave-owning society shaped Sparta. From nearly the beginning, the slaves, or helots, outnumbered the Spartans. All slave-owning societies fear a slave revolt. The Spartans had more to fear than most. The concerted militarism of their society wasn't an expression of athletic prowess, or an ideal of strength. It was the way they stayed alive. The more Sparta expanded, the less they could afford to let their guard down. Sparta, like many cultures with a secret police force, was a culture of paranoia. During a helot uprising, Athens sent troops to help Sparta put the rebellion down. The Spartans sent the Athenians packing. They didn't want Athenian values disseminated among the Spartan population, and especially the helot population. Today, the Spartans are portrayed as a freedom-loving culture – even if they only valued their own freedom. In truth, their actions and thoughts were kept in line by the government and the law. Which isn't to say the Spartans didn't enjoy some freedom. Their women enjoyed the greatest freedom in ancient Greek culture, and were encouraged to read, write, own land, speak up when it came to politics, and practice sports. The upper echelon of warrior men, who had survived battles and attained rank and power, were honored and given a free hand. The dark side to this free hand is exemplified by no less than one of the fabled 300. Aristodemus was one of the warriors at Thermopylae. He and another soldier came down with eye infections at the beginning of the fight. Leonidas, their king and commander, ordered them to go home. The other warrior, on the final day of battle, had a slave guide him to the field. Aristodemus, meanwhile, obeyed orders and went home. He was branded a "trembler," and suffered the fate of anyone judged to lack courage. He had patches sewn onto his cloak, letting everyone know he was a coward. All his acquaintances were to ignore him. If someone ordered him out of their way at public events, he had to obey, no matter who they were. The Spartans were early eugenicists, and as Aristodemus had proved his genes were faulty, his daughters were no longer allowed to marry. A year later, when the Spartans faced another incoming force of Persians, Aristodemus was allowed to fight, and ran eagerly to his death. His willingness to die was noted, his status as coward was officially revoked, and his children were no longer forbidden from breeding. Either Spartan soldiers would fight to the death, or Spartan society would make them wish they had. None of this negates the impressive Spartan military victories, but it does put them in context. When we picture "warrior cultures" or "militaristic societies," they are often represented to us as cultures focused on honor, bravery, freedom, or even just the exhilaration of battle. That is the way many see the Spartans, and probably the way the Spartans saw themselves — but idealism wasn't what created their society. Their military was a practical solution to a problem. Eventually it became the only solution to that problem. And though individual warriors were taught, and believed, that courage was the ultimate virtue, their idealism was braced by more than just morality. Each soldier knew he could risk his life and have everything, or keep it and have nothing. It was not death before dishonor. It was death before unending abuse and contempt. That here, obedient to their laws, we lie. This poem by Simonides of Ceos commemorates the most famous battle in western history. The attacking Persian army, forced to a choke point, was held at bay by a force of only 300 Spartans. And a few hundred of their slaves. And about a thousand other Greeks from different city-states. Also, there was a naval battle nearby, to keep the Persians from simply saying, "screw it," and sailing around the Spartan force. The Persian invasion took place at an inconvenient time for the Spartans. The Olympics were happening, as well as a religious festival. If there was one thing the Spartans took as seriously as their fighting, it was their religion. They couldn't abandon the festivities, but everyone, including the other Greek city-states, knew the threat that the Persians posed. 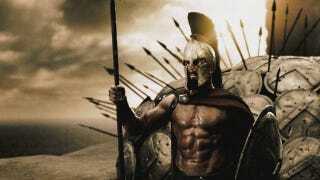 In the end, Leonidas led an elite group of 300 Spartans out to fight. (Leonidas might have felt especially pressured to go, as there were rumors that he'd killed the previous king of Sparta and married that king's daughter in order to assume the throne.) Other city-states contributed soldiers, and the overall force at Thermopylae was 5000. Greek runners stationed on the path warned Leonidas, and he ordered most of the other soldiers home. There was no question that the Spartans would stay. They also kindly volunteered their own slaves. What's surprising is the fact that at least a thousand other Greeks chose to stay, knowing that they were to be massacred. The Spartans led the forces at Thermopylae, and their bravery isn't in question. They weren't the only soldiers who bravely stayed. Not only weren't the Spartans the only ones to die at Thermopylae – they weren't even the majority. They did, however, have the best PR. Even in their own time, Spartans were revered for their fighting ability. Their performance at Thermopylae became a contemporary myth, and some historians do believe that it rallied all of Greece to successfully resist the Persian encroachments. That being said, they were not undefeated. The most infamous Spartan defeat was during the Peloponnesian War, a decades-long war between Athens and Sparta that started not long after the end of the Persian threat. The defeat shocked all of Greece, including Athens and Sparta, because the Spartans weren't just beaten. They surrendered. It was the Battle of Sphacteria in 425 BC. Sphacteria was a little island, technically in Sparta's own territory, on which a Spartan force was isolated after a larger battle didn't go their way. The Athenians laid siege to the Spartans, who had sheltered against some cliffside terrain, showering them with arrows and eventually surrounding them. The 120 Spartans gave up their weapons and surrendered. Another group to kick the Spartans around was the famous Sacred Band of Thebes. Thebes provided its own 300 super-soldiers, although they have never been the subject of a film, possibly because they were all lovers. It also possible that the Sacred Band never got their stories on film because, by the time they were formed, the Spartans had already taken some hits. Thebans formed the band just after they had kicked the Spartans out of their capital city. The Sacred Band won three different battles against Spartan forces. In one of the battles, in 378 BC, they won simply by refusing to follow the Spartans onto unfavorable ground. The Spartans had breached outer blockades in front of Thebes and the Theban army retreated behind the inner walls. When the Spartans charged, hoping to make the Thebans break ranks, the Thebans were ordered to assume a resting posture, calling the Spartan's bluff. The Spartans left, and then predictably complained that they should be considered the winners of the battle because the Thebans hadn't fought them right. The Sacred Band directly fought the Spartans on two different occasions, and were outnumbered each time. In Battle of Tegyra, outnumbered two to one, they killed the Spartan commanders and charged the ranks so boldly that the Spartans opened up a channel, assuming the Thebans would use it to escape. Instead, they attacked from within and routed the Spartan troops. In the Battle of Leuctra, the Theban cavalry made short work of the Spartan ground forces, despite the fact that the Thebans commanded a force of 6000 to the Spartans' 10,000. In the end, the Spartans' greatest defeat came at the hands of their own slaves. The military defeats took their toll on Sparta, as did the Spartans' slow accumulation of enemies. Eventually, the catastrophe that the Spartans had built their culture to avoid happened, and the helots successfully rebelled. Sparta was built on slavery, and with most of its slaves gone it was impoverished. It dissolved into a kind of Disneyland, where traditional Spartan rituals were performed for money in front of visitors. Its last king died trying to raise money for the city by fighting as a mercenary. No country falls gracefully, and no entity can live up to its myth. The point of myth is to take an inspiring story and turn it into a perfect one. The Spartan legend, the legend of the supersoldiers, while based on reality, wasn't entirely applicable even in the Spartans' own time. The myth of the 300, of Thermopylae, and of Sparta as a culture of perfect warriors, has value. The reality of Sparta as an imperfect society does as well.